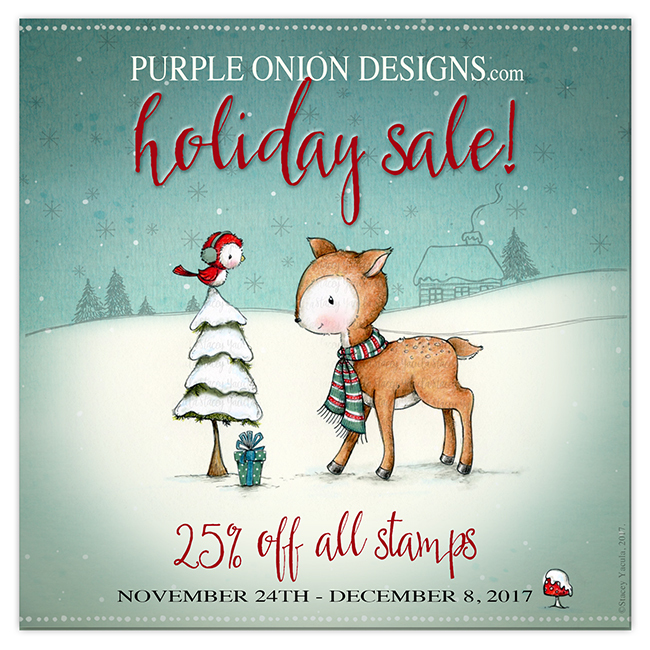 I'm very excited about today's post because it's the start of the holiday sales at Purple Onion Designs! All stamps are 25% off including the stamps in the sales category from now till 8 December! In celebration of the hop, Sandy Allnock is giving away spots in a class of their choice to 3 lucky commenters along the bloghop - so be sure to comment everywhere! If the winner has already purchased a class during the current sale, that class fee can be refunded. Winner will be posted on Sandy's blog on December 1, 2017. Good luck! Sentiment from: Essential Holiday Greetings Sentiment Set new! 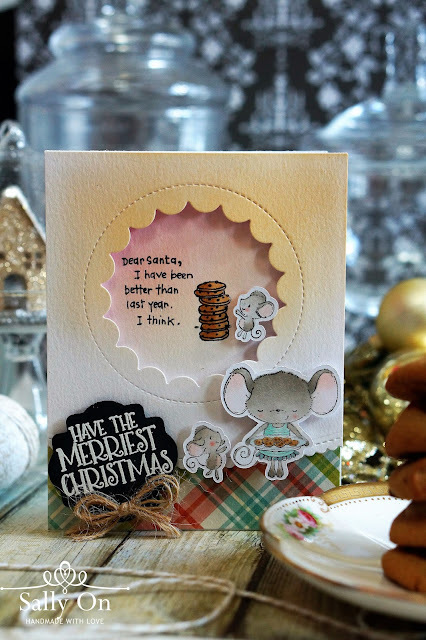 If you have notice, I've omitted the frame and the glass of milk from Dear Santa and stamped it right in the centre of a die cut stock card using Jumbo Peek-a-Boo Circle Windows from My Favorite Thing. I also blended a little distress ink in dried marigold to add a little warmth to the card. I particularly love how the sentiment turned out on the black label I cut from my Silhouette Design studio library as it gives a chalkboard effect! Would you like to win a art class? All you need to do is follow the links to all the blogs and comment on their creations as you go :) Let's now hop over to Hannah Rubenstahl's blog! 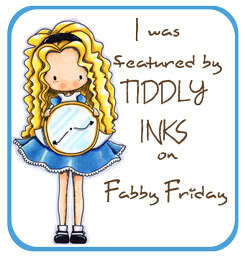 I hope you like the card I shared today :) Thank you for stopping by and have fun blog hopping! Oh my goodness! These mice are adorable! Thank you Sandy :) cookie is the best thing! super cute card! I love that cookie scene. Love the window die you used also. love the card and the cookies! So cute...those mice, though! I love your card! Your card is super sweet. These cards create such a wonderful 3D affect. I really appreciate the attention to detail and the three stockings hanging from the mantle really are cute. Thanks for sharing your talent. Happy Holidays..
Beautiful, I love your soft colors! Really love your cards and this stamp set! It’s going on my wish list. Thanks for sharing.. Thank you for stopping by Doris :) I'm glad you like my cards and the stamps! It's a good time to do some shopping with the 25% off! Beautiful card! Love the cut-outs! Great card. The cookies look good enough to eat. Thanks for sharing. 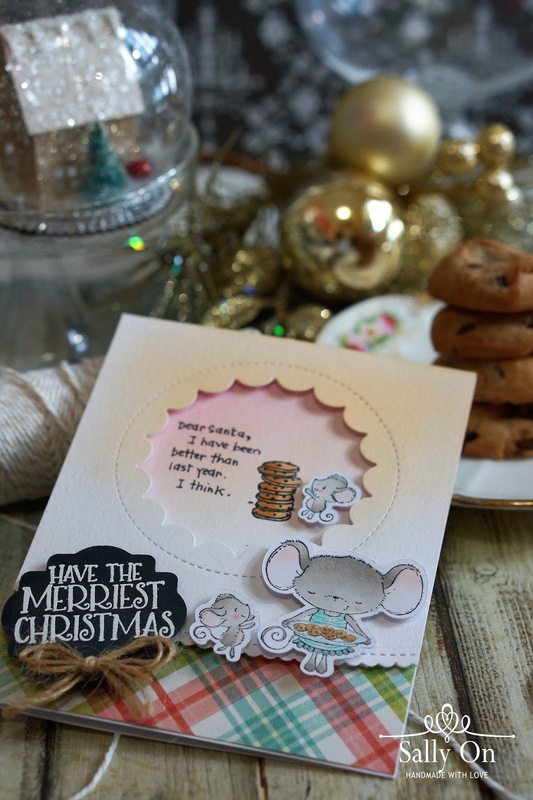 Adorable card and those cookies look yummy! Love your card...so cute! Love Purple Onion Designs stamps! An adorable card Sally. So very sweet and I love that sentiment (need to add to my wish list). Thank you for stopping by Nancy :) Yes the sentiment is kind of fun and I thought it goes well with the baking mice! Fabulous card, love the details! Darling card with the adorable mice! Love the colors and details! This is an irresistibly cute card ! Little mice and cookies...so nicely colored and placed...love mice, except in the house during winter! The little mouse is soooo adorable! TFS! Yes the little ones are cutest! Thanks for stopping by! Oh my gosh, this is cute, cute, cute! So pretty cute. Love this. Love this little card! Those mice are adorable! Your coloring is so soft and pretty! Loving this hop with all it's talent and inspiration! I had no idea POD stamps were so stinkin cute! Thank you Debbie for your kind words! Glad you can hop along the blogs and be inspired with all the other wonderful creations! Yes POD has some of the cutest critters! Cute sentiment and I like the card design. If you give the mouse a cookie... Love the card! So adorable--and I think the same thing, perhaps I'm a bit better than last year?! Love these cute mice! SOOOOO cute. Love the way you put the images in the scalloped circle. Your card is so cute, the colors are soft and go wonderful together. 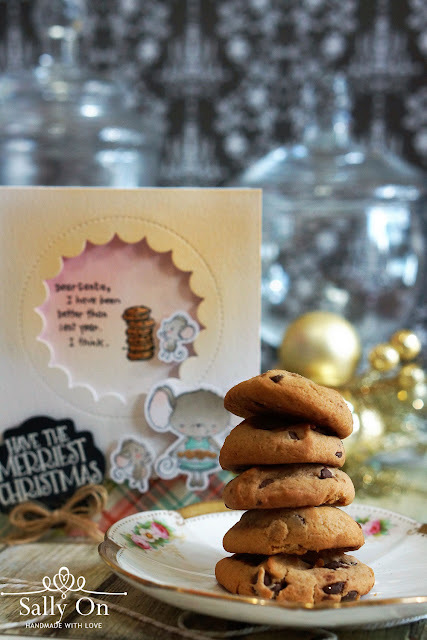 The cookies look yummie on the card and on the plate. I like the composition and the placement of all the elements. 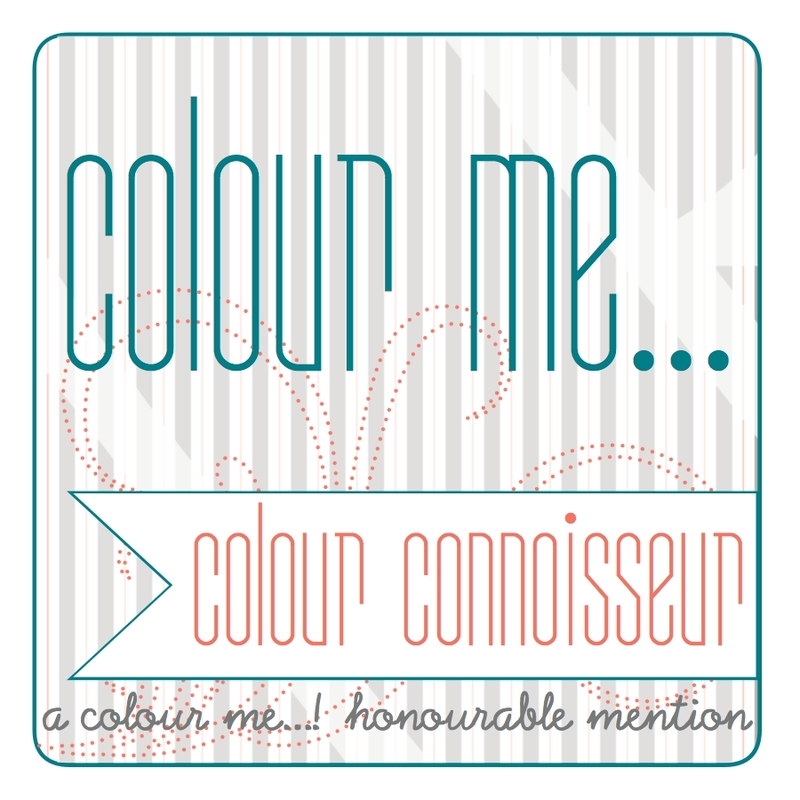 Great blog hop to start with! Your card is adorable!